The AJ-220S from Epiphone improves upon a classic design to build a dream guitar that comes in at a frankly astonishing price tag. Not only that but over 100 years of guitar building experience has been poured lovingly into this gorgeous instrument. Firstly, the unique bell-shape - large lower bout; small, rounded upper bout - gives the AJ-220S a distinctive character. The lower bout allows the beautifully selected solid sitka spruce top and mahogany back and sides to create a rapturous sound, normally associated with jumbo-sized models. However, the smaller upper bout makes it incredibly easy for anyone to play this guitar, as it saves him or her from having to negotiate a cumbersome jumbo design. This makes it particularly suited to lone singer-songwriters who require a powerful solo voice when playing alone, but guitarists who play as part of a band or ensemble are easily catered for with this gem. The bright-sounding solid sitka spruce top only gets better with age, and the more you play it the more unique the voice of your AJ-220S will become. The mahogany back and sides reinforce the low-end tone to ensure a well-delivered tonal punch. Married to the body via an exquisitely fashioned dovetail joint is the robust and reliable, SlimTaper-profiled okoume neck. Atop this rests a sumptuous hardwood fingerboard housing 20 delightfully playable frets adorned with pearloid dot inlays. You needn't have long hands to play the AJ-220S as the perfectly proportioned 25.5" scale length accommodates just about everyone, from children to adults. The satin finish along the back of the neck makes it a fast-playing dream, again making it an excellent live partner. Whether you're just starting out or a seasoned pro - for the spec, the tonal versatility and for the sheer joy that it is to play - you'd be hard-pressed to find a better guitar than the Epiphone AJ-220S acoustic. Posted on 11/01/2015 by Jaime Purchasing an acoustic guitar was a new venture for me. I've always been a bassist but had have some past lead guitar work to add to my musical CV, so buying the right acoustic guitar was crucial. I didn't want some poorly-made collective of wood and strings. I didn't want some 'beginners pack'. Something like that is uninspiring and having only a £200 budget really did filter down my choice. 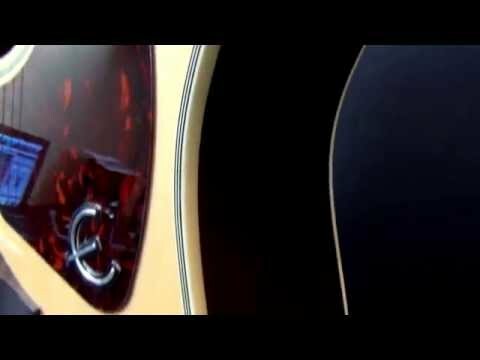 Epiphone is a guitar company that has a fine reputation for crafting guitars that give people a 'taster' of their more expensive Gibson counterparts. They have become so good that many musicians now treat the higher-end Epiphones as an 'alternative' to a Gibson. I didn't want a bottom standard model so I looked at the reviews and found immediately what I wanted: The AJ-220s! The AJ standing for ‘Advance Jumbo’. The guitar is well-made, has a wonderful finish to it, and looks far more expensive than its price which is £125. The neck is smooth and the satin finish is a joy to play. The sound is just like what you would get from a more expensive model and if you closed your eyes for a few seconds while playing, you would think it was a £500 guitar. The top wood used is solid Sitka spruce and the body is select mahogany, as is the neck. The hardware is nickel. The overall bell-shaped body is well constructed; the premium tuners stay in tune, and it was near enough perfect right out of the box. And that is a great sign of just how good the quality control at Epiphone is. The bass and the tone sounded sweet and the fingerboard is beautiful. All-in-all, it looked and felt brilliant. And visually, it was rather reminiscent of a Gibson J-45. Now, let’s look at the playability. The general feel was comfortable and the narrow neck eased me into the first few chords with all the familiarity of an old friend. It was so easy to play and I settled into my first riffs without a modicum of fret-buzz. The strings felt standard but that isn’t a big issue. I have owned a Rickenbacker 4003 bass from brand new and their strings were standard, also. And besides, strings can get upgraded. Again, no big deal. The guitar performed well and the sound projection was very reasonable for a guitar of this price range. Don't get me wrong, I'm not waxing lyrical about Epiphone, but I want to give you all a decent review about this guitar. And what you get for your £125 is a lot of guitar for the money. And I mean a lot. So much so that I think Epiphone should get a ‘magnanimity’ award. What I find so endearing about the Epiphone AJ-220s is that it's a guitar that swiftly transcends the 'beginner’s barrier'. Once you buy this as an acoustic newbie I guarantee that it will stay with you as your playing skill builds. It has that sort of quality about it. And if a guitar manufacturer can do that, then they've truly done a great job. Posted on 27/12/2014 by Kav Thought I'd treat myself to an acoustic guitar. Haven't played for years so could only remember about five basic cords. Was after a budget entry level guitar and set aside £200. Having spoken to the guys in the Chester shop today, we settled on this beauty. It's £50 less than the other model I had in mind and uses the same materials and is made/built in the same way. Build quality is excellent. Paint job is brill. Texture and feel is of a premium finish. I'm really made up. I've been strumming away to my five chords and love the feel and sound. Would not hesitate to buy another one of these. The sales guy in the shop was really talented so he played a lot of riffs on each guitar we were looking at. This one sounded great and even competes with the guitars in the £225 bracket - And I've still got £75 left of my budget. Result!! !